The mission of The MAP Kinase Resource is to collect the information about MAP kinases, share it with a scientific community, students and all other interested. We would also like to improve communications between medical and life science professionals who are interested in MAPkinases. 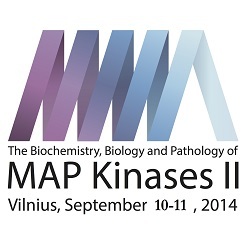 The MAP Kinase Resource Website was created in 1998. The inspiration at the time came from other specialized websites, such as websites on receptors, transcription factors, etc. The main idea was to concentrate the information about MAP kinases otherwise scattered all over the internet as well as scientific literature and link this information to NCBI protein database and/or PubMed. During more than a decade of it’s existence, MAP Kinase Resource has been linked to many life science websites, as well as praised by many scientists, students and hobbyists, interested in MAP kinases in particular or in cell signaling in general. Due to the success and the potential of the project, in 2011 we decided to renew and improve it. With a help of IT professionals a new design was created, the site was updated and moved to it’s new domain. We are committed now to continuously improve, update, broaden and develop the website. We also expect the active participation in our activities, such as forum, writing and the development of the website. We also are open to your donations. 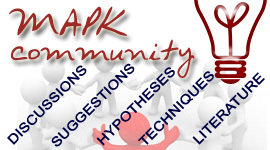 Best wishes from the MAPK Kinase Resource team!